Streaming television services, connected lights, iPads and Chromebooks, and smart devices are becoming common, even in non-techy homes and businesses. Their growing use has made WiFi coverage throughout your home or office a necessity. When we first installed WiFi, we had one router that reached in the back part of our building where the computers, iPhones, and the Netflix box were usually located. WiFi was weak in our front rooms and garage, but we were rarely in those locations looking for the Internet.. But then iPhone apps and Amazon Echos changed our needs. Our response was to get a WiFi extender, but to be honest, that solution was not great. We had to teach every device the main WiFi name, “REDDOG”, and its password. We had to teach every device about the extended network names, “REDDOG-EXT1”, and passwords. As we carried our phones and other WiFi devices from room to room, they had to switch from network to network, and the hand-offs were often flawed. About a year ago we switched technologies to a Mesh System. With a mesh system you connect your first unit to the ethernet from your ISP’s modem and configure the connection using a phone or tablet app. Then you plug in additional units around your home/property and quickly tell them via the app to join the WiFi network they are extending. These extenders use the same network ID, “REDDOG”, and password as the original unit. This means that your phones, tablets, and other devices don’t have to learn many different network names, and they don’t have to switch networks as you move them around. In our experience, the mesh network has been noticeably more reliable and easier to set up and maintain. In addition, the mesh network is faster and has tri-band capability, which has allowed us to stream video and audio to different devices simultaneously. These systems are a bit more expensive, $300 for two units, instead of maybe $150 for a base router and $100 for a WiFi extension. 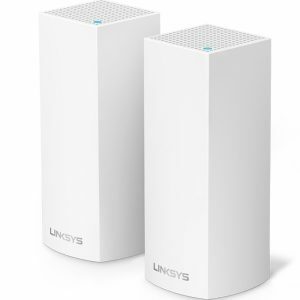 But, as you discover more WiFi devices you “need” to use in the corners of your home or property, the mesh network solution is clearer superior to other options..
We bought a Linksys Velop two-unit system from Amazon a year ago, and it’s been reliable and trouble free. When we disrupted the network by making bad decisions on some setting changes, Linksys’s free support quickly helped us get back up. So, we recommend the Velop. It looks like the Linksys is also first choice of PC Magazine. 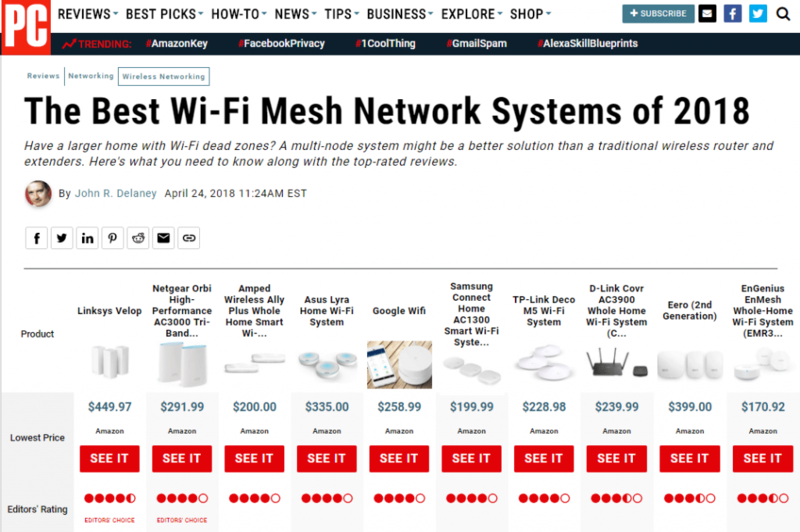 PC Mag has more information on mesh networking — good geeky reads And, the best prices for Velop Systems still seem to be at Amazon. We are telling our friends and clients to go mesh!